Richard Stobbs was born in South Shields in 1826 and by 1852 had a boatyard at Coble Dene on the west side of North Shields. In censuses he is described firstly as a Master Boatbuilder and then as Steamboat Builder. He is listed as sometimes building in association with Robert Stobbs (his brother maybe?). In the 1881 census he is described as Secretary to Tyne Steam Tug Insurance Co. 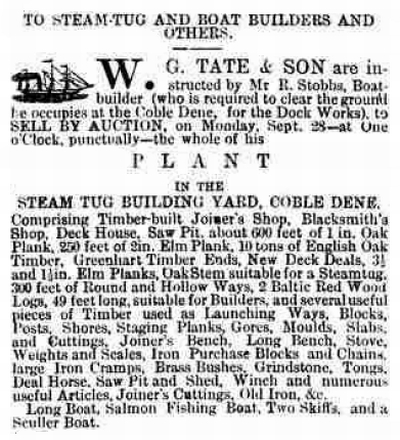 The land for the boatyard was taken over by the Tyne Improvement Commission in 1874 to allow them to build the Albert Edward Dock on the site of Coble Dene.